After meeting the challenges of the Dark Spirits and protecting the city, the Toa Metru have left the city to go help others in need. But they are called back to Metru when they realize that they had left members of their group behind when they left the city. But when the Toa return to Metru, they find that the city has been overrun by the strange spider-like creatures known as the Visorak. 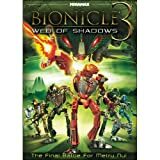 The Toa are captured by the Visorak and wrapped up in a web of shadows. When the Toa emerge from the web, they are nothing like their original form. But they still must find a way to defeat the Visorak and save the city.